This Polish kołaczki recipe is made with a cream cheese dough that bakes up buttery and flaky. Kołaczki can be round, square or diamond-shaped, and the dough can be flaky or yeast-risen, and the spelling varies widely. 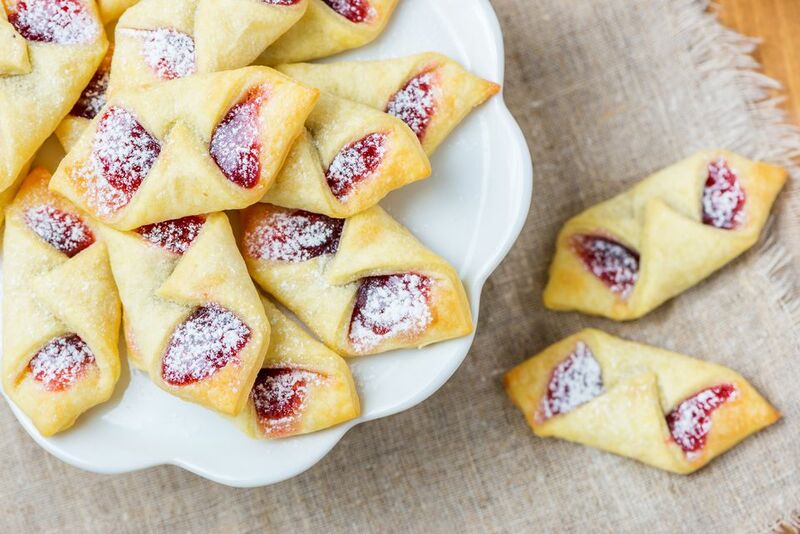 Fillings of choice include apricot, raspberry, prune, almond, poppy seed, and sweet cheese. Anything goes—strawberry, blueberry, even pineapple. You will need to refrigerate the dough for at least 1 hour before rolling and cutting, so plan accordingly. You can freeze unbaked filled kołaczki, then bake frozen (you will have to add a few extra minutes to the baking time). In a large bowl, beat cream cheese with butter until light and fluffy. Add flour, 1 cup at a time, and mix well. Wrap dough in plastic and refrigerate for at least 1 hour. Roll out dough 1/4-inch thick on a silicone mat or a surface that has been dusted with equal parts confectioners' and granulated sugars (not flour), because the granulated sugar will act as ball bearings and help keep the dough from sticking. Cut into 2-inch squares. Place 1/2 to 1 teaspoon filling on center of each square. Overlap opposite corners of dough to the center over filling, pressing dough together lightly. Alternatively, brush a tiny bit of beaten egg white on one point and press the opposite point on it. Bake for 15 minutes (longer if baking frozen) or when corners start to brown. Cool completely and dust with confectioners’ sugar. These tend to become soggy if held for several days, so store them tightly covered without the confectioners' sugar. Dust with confectioners' sugar just prior to service. If you find yourself with leftover fillings, they can be frozen in a zip-top bag or​ another container with little loss in flavor or consistency. Just defrost them when you're ready to use them. Pour off any accumulated moisture on the surface. As for the kołaczki themselves, fill them and freeze on a parchment-lined sheet pan. When completely frozen, transfer to a freezer-safe container separated by sheets of parchment paper. Bake them from the frozen state. Don't freeze baked kołaczki. When defrosted, they will be soggy and unpalatable.